The Hon. Glenn Berman, JSC (ret. ), Of Counsel in the firm’s Litigation Department, recently received the 2015 Arthur H. Miller Lawyer Achievement Award from the Middlesex County Bar Association. 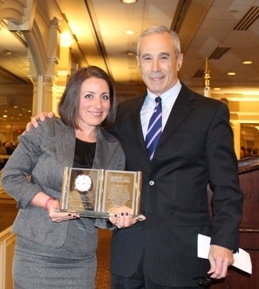 Presenting the award to Judge Berman at the Bar’s January 21, 2015 General Membership Meeting was Immediate Past President Tara Auciello. Judge Berman focuses his practice on mediation, arbitration, and discovery management of complex family, commercial, estate/probate, real estate and general equity matters. His practice area also encompasses special master services, settlement conferences and law enforcement investigations. Following a 17-year career in private practice, Judge Berman served in the Superior Court of Middlesex County from 1989 to 1998, following which he was appointed Prosecutor for Middlesex County. In 2002, he returned to the bench and served in various capacities prior to his retirement on January 1, 2013. He has authored published opinions encompassing all four divisions of the New Jersey Superior Court; General Equity, Family, Civil and Criminal.